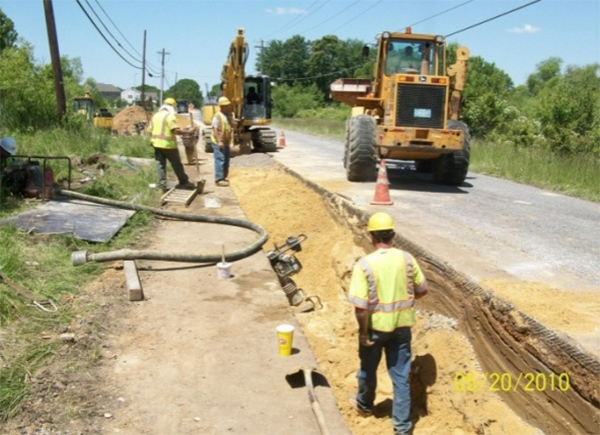 Woolwich Township, Gloucester County, NJ – To increase water distribution throughout the fast growing Woolwich area, our utility client required the addition of a new 16-inch Tyton Ductile Iron Pipe Water Transmission Main on High Hill Road. This main runs 5,953 feet from the Tri-County Regional Pipeline at Township Line Road in neighboring Logan Township, where it interconnects with an existing water main within a residential development. The project included the location of an air relief valve at the highest point on High Hill Road, and the location of a meter pit as requested by the client. Reports included information regarding sensitive environmental areas adjacent to the construction area. Plans included traffic control and soil erosion measures. The mains were hydrostatically tested to ensure integrity and chlorination treated prior to being placed in service.